I remember watching Ken Burn’s documentary “Jazz” eleven years ago on PBS with mixed emotions. I was at once both thrilled that the subject was getting a serious treatment on television and disgusted with the gaps (editorial choices made) in the music’s history. Burns seemed to subscribe to a “great man” theory of jazz history where Buddy Bolden, Louis Armstrong, and Duke Ellington loomed large, Miles Davis was portrayed as a sellout and John Coltrane was a footnote. Burns was clearly aided and abetted in this revisionist treatment by the apparent savior of jazz in the 1980’s, Wynton Marsalis (a fine but highly opinionated musician). Yes, according to Burns, jazz was moribund in the 1960’s dead by the 70’s and awaiting a resurrection (and enshrinement at Lincoln Center) by Marsalis and the other young lions of jazz in the 1980’s and 90’s. Really? The embrace of jazz’s gospel roots exemplified in works such as Mingus’ 1959 “Better Git It in Your Soul” continued throughout the 1960’s with the Soul- Jazz movement and albums like Grant Green’s “Feelin’ the Spirit” and Cannonball Adderley’s “Mercy, Mercy, Mercy”. How could anyone overlook the jazz of the 1960’s when soul-jazz and the hard bop of Horace Silver and Kenny Burrell coexisted with the fiery free jazz of Coltrane and Pharaoh Sanders? Armstrong, by the way, was enjoying mainstream success at this time even though some now viewed him as a sellout and his greatest accomplishments were well behind him. Ellington was viewed as a national treasure (contrary to Marsalis’ characterization of him as not being appreciated and tiring of being asked trivial questions, such as, what he thought of James Brown). At a time when modern classical composers were hailed for their embrace of tape machines, creative editing and electronics Miles Davis was accused of selling out for doing likewise. Much is made of how he supposedly saw the success of Hendrix and Sly and desired to have that success for himself. However, his fickle critics often fail to mention that he recruited highly talented, accomplished and creative musicians to join him and generously mentored them and they, together with Miles, created innovative music that influenced subsequent generations of musicians and this music is enjoyed and acclaimed to this day. Burns emphasizes the fact that in the 1940’s jazz was the music that average black people enjoyed for entertainment. He devotes entire segments of his documentary to couples who danced to this music in New York City clubs. Yet, even though he was born in Brooklyn, he seems totally unaware that jazz was also extremely popular among urban and suburban audiences in the 1970’s. New York had a popular jazz station in the 1970’s, WRVR-FM. Jazz fusion by the artists Weather Report, Mahavishnu Orchestra, Return to Forever and even Pharaoh Sanders was played on New York rock stations, such as, WNEW-FM. Moreover, building on the soul- jazz movement of the 1960’s, funk-jazz had captured a large following. Today, one might infer that the output of CTI records was merely a precursor to today’s “Smooth Jazz”. However, if you look deeper you will see that the artists on CTI represented funk-jazz, while the sometimest slick production values and penchant for orchestrations of CTI namesake Creed Taylor did foreshadow the excesses that came to define smooth jazz. It was he who helped Wes Montgomery cross over to pop. Yet, even though Wes may be excoriated by some for giving in to the commercial instincts of Taylor, I still love listening to him, even with strings. But, I digress. On August 27, 1975 I attended my first jazz concert anticipating that this would be a modest, laid back affair. After all, jazz was dead, according to the critics. 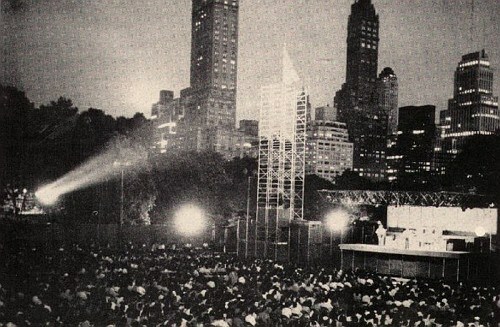 The concert was held in Central Park’s Wollman Skating Rink as part of the Schaeffer Music Festival, an ongoing summer concert series of the 1970’s. The rink held about five thousand at capacity and top ticket prices were $3.50 at the time. The performers were the CTI All Stars: The top young jazz musicians of the day. The lineup included: George Benson on guitar, Ron Carter on Bass, Joe Farrell on tenor sax, soprano sax and flute, Grover Washington Jr. on tenor sax and soprano sax, Hank Crawford on alto sax, Hubert Laws on flute, Bob James on keyboards and Idris Muhammad on drums. I don’t know exactly how many were in attendance but it was well over five thousand. It seemed to be double that number. There were people wall to wall inside the concert space. My friend and I could not see the stage even though we had arrived early. We were backed against the wall by the refreshment stands and could tell that the crowd had come with the intention to party hearty. Moreover, as Creed Taylor estimated in an April 29, 1972 Billboard article about the CTI summer concerts in that year, 80 percent of the audience was black. This jazz was the music of the people. It was not dead. It was not yet a “classical” music being taught in academia and only enjoyed by an elite who could afford concert hall prices. I did, nevertheless, want to actually hear and see the concert versus just experience it as part of a party atmosphere. So, we left the venue and ventured up to the hill overlooking the stage where we could hear well, see the stage, and, enjoy our beverages in the NYC moonlight without distraction. Click on the mp-3 link at the top of the post to hear Benson and the gang play Dave Brubeck’s Take Five from this show. You can hear the crowd and appreciate that this was no staid affair. “Jazz just kind of died,” said the saxophonist Branford Marsalis. “It just kind of went away for a while.” – My least favoiite part of the Ken Burns documentary as well. I have a hard time listening to anything by Marsalis as all I can thing of is while he plays is his revisionist attitude towards jazz that is not to his taste. I think history will show that both Marsalis and Burns are footnotes to the story of jazz and the music of the 60’s and 70’s will endure. Thank you so much. Philly has a great public radio station that plays jazz. I have heard it on my way to Ocean City, Md. I look forward to following your blog. The cheapest most incredible Jazz concert ever….any concert in that case…beng from Pittsburgh and living in the Bronx 168 St. / Teller Avenue at the time…boy I wish I could get a video of that concert.